You can see more of Leon’s photos here. Wow. There are a lot of layers here. First, the quotation marks, are they there to cover the proprietors, just in case it doesn’t turn out to be the last meal for real? 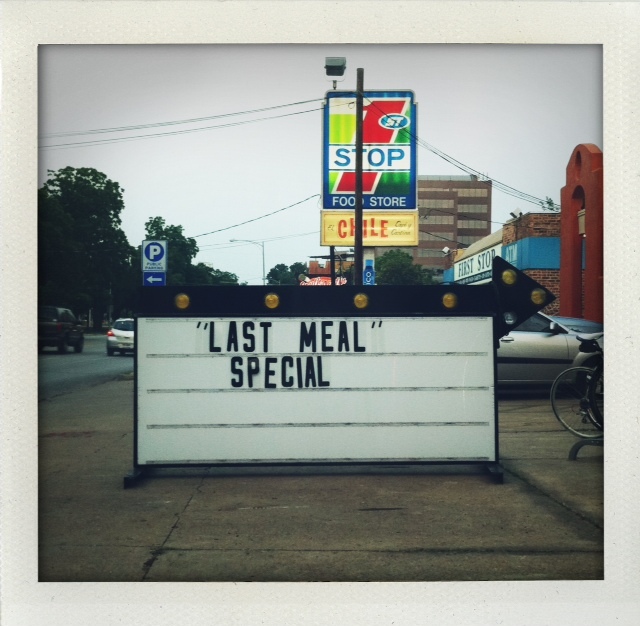 Then, how about the idea that the restaurant is having an end of the world special? “We better unload all this food, ’cause we don’t want it to go bad or get wasted.” Or, if they don’t believe it themselves but expect their clientele to have bought into it, that’s just the height of cynicism. I hope they’re now offering a “so you didn’t get raptured” special, too. There’s more here than I can handle.